After attending the lecture on the Pink River Dolphins (Inia geoffrensis) presented by David Bonnett, lovingly dubbed as the fairy godmother of PTMSC, I left feeling inspired to head south to live with the riberenos in an effort to further study the elusive dolphin! Bonnett has been traveling down to the Amazon since 2000 with his wife. Once they arrived they connected with the riberenos, native mestizo peoples, and felt compelled to stay awhile supporting local schools. 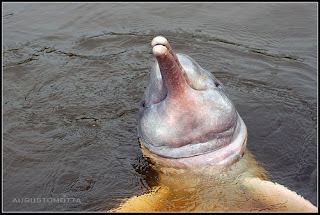 Bonnett learned about the mysterious pink river dolphin, a sacred animal of the riberenos . These river dolphins are a special breed, fresh water dolphins, that became isolated in an inland lake when geological changes caused the Andes to rise. While we are uncertain as to why they have a pink fleshy tone to their skin, Bonnett says their skin changes hues while interacting with each other...especially during mating! It is difficult for anyone to know exactly how many Inia geoffrensis exist; while they are considered a threatened species in Peru, they are not carefully protected outside of wildlife reserves. The Inia geoffrensis is an amazing animal that is quite different from its cousin, the bottle nosed dolphin. It is classified as a Platanistoidea, but falls in the same superfamily as other cetateans. It has a narrow snout and it's neck vertebrae are not fused together enabling it to bend its neck at 90 degree angles from it's body! The Inia have almost malleable spines, that allow them to swim around trees of the flooded forests. They prey upon catfish, other fish, crustaceans, crabs and turtles. While the land and people are beautiful, there is much to be done in the way of helping the riberenos and the Inia geoffrensis. Many of the communities are isolated and lack access to education and family planning. Some, like the Bonnetts, feel the draw to head South to do their part setting up schools, medical clinics and educating communities about over harvesting wood from the rainforest. The Bonnetts have decided to devote much of their life to studying the population numbers and perhaps in turn, the health of the pink river dolphin, a keystone species. Bonnett has determined that the best way to estimate population numbers will be to use a hydrophone to record individual voices of the Inia geoffrensis. While the research is still in its preliminary steps, Bonnett feels he has enough data to support his theory that each dolphin has a distinct "voice" and while the current technology and physical location of the research sites make it difficult to sample, Bonnet is hopeful that further recordings will enable researchers to count the population size(s) of the Inia geoffrensis. Now...don't you feel inspired to go to South America?? Well, you can help even from the comfort of you own home! If you have an old digital camera gathering dust in one of your closets, Dave Bonnett and his wife are taking a load of digital cameras down in June to aid in a project that teaches art. If you are interested in donating a camera please email me and I will put you in touch with Dave! A piece of advice: Legend states that making eye contact with an Inia geoffrensis will give nightmares for the rest of ones life. Want to learn more about what is being done? Read about Projeto Boto! This blog is a terrific addition to the PTMSC web page.